Learning the Heimlich Maneuver for Dogs could save your Schnauzer's life. Would you know what to do, if your Mini Schnauzer began to choke? Don't wait for a crisis situation. Learn the proper steps now. Miniature Schnauzers love to explore new things and that usually means swallowing things they shouldn't (like bones, small toys, sticks...) And time is of the essence, if your Schnauzer begins choking. It's a scary situation: Your Miniature Schnauzer starts coughing and hacking. Then his eyes begin to bulge and he furiously paws at his mouth, desperately trying to free the obstruction himself. Your Miniature Schnauzer's choking and literally dying right before your eyes! If you learn how to perform the Heimlich Maneuver for dogs you will be better prepared to assist your Schnauzer in such an emergency situation and very possibly, save his life! dog safety tip: Toys that are too small pose a threat of choking or ingesting of a foreign object to your Miniature Schnauzer. Here is a simple way to test your Schnauzer's toys to see if they are too small for him to play with. If the toy is small enough to drop down the center tube of a toilet paper roll, it's too small for your Miniature Schnauzer. Read more tips on buying dog toys. Another important reminder: Be sure to routinely check your Miniature Schnauzer's toys for damage parts and always supervise your dog during play. The Pet First Aid Secrets First Aid Manual, by Dr. Andrew Jones, will show you the techniques you need to know to be prepared for an emergency with your Miniature Schnauzer. Dr. Jones wrote this manual as a guide to help pet parents become better prepared to handle emergency situations and thereby giving one's pet the highest possible chance of survival. Step by step treatment options for the most common emergencies including: car accidents. fractures, abdominal wounds, treating for shock, dog bits, vomiting, chest injuries, poisons, bleeding, and more. Open your Miniature Schnauzer's mouth and see if you can see the obstruction. If you can, try and remove it. If you cannot see the object causing the obstruction, pick your Schnauzer up and turn him upside down (with his head pointing to the ground and his spine up against you). With your arms wrapped around your dog's lower abdomen, gentling sway him back and forth a few times and then give three sharp thrusts to his abdomen area. 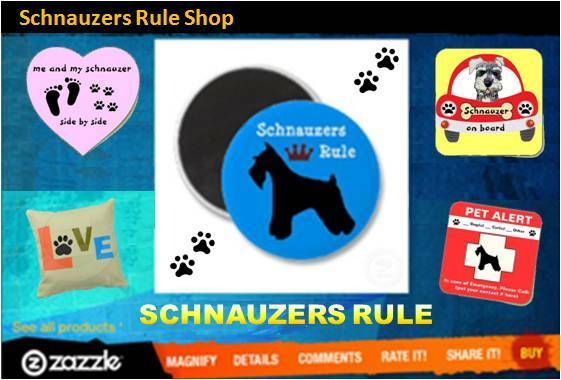 Now lay your Miniature Schnauzer on his side, open his mouth and sweep his throat to remove the object. If you cannot remove the object, with an open flat hand, strike your Miniature Schnauzer once sharply, in between his shoulder blades. Repeat these last 2 steps until the object dislodges and you are able to remove it from your dog's mouth. Call your vet. You will want your Miniature Schnauzer's vet to examine your dog after the crisis is over with to ensure your Schnauzer suffered no internal injuries. Caution: When dogs are in distress they may react with a bite. So be careful when handling your Schnauzer as he too may try and bite or snap at you. Lay your Miniature Schnauzer on his side, on a hard surface. Place a pillow or rolled up towel under your Miniature Schnauzer's hindquarters and tilt his head down. The main objective here is to have the front part of his body lower than the back part of his body. Place one hand against your Miniature Schnauzer's back and the other under the center of your dog's ribcage. Press 3 to 5 times upward in a thrusting motion until the object comes out. Call your vet after the crisis is over. If your Miniature Schnauzer is no longer breathing, after you've dislodged the obstruction, find out how to perform Artificial Respiration and CPR for Dogs. "Knowledge Share"... If you found this page on Heimlich Maneuver for Dogs helpful and informative, please share it with your dog-loving friends by clicking on one of the share links (like facebook, twitter, and google +1) located at the top right or bottom of this page.